As the autumn season reaches it's peak in Quebec, a haze is often seen on the surface of Lac Monroe , a result of the difference between the water and air temperatures. A peaceful serene setting as the cooler autumn evenings approach, creating a haze on the water surface of Lac Monroe in the Parc national du Mont Tremblant, Quebec, Canada. 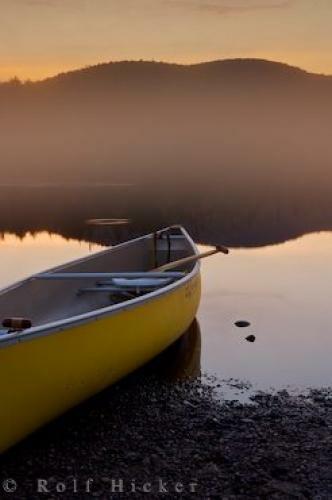 Canoe on the shore of Lac Monroe during sunset in Parc national du Mont Tremblant, a Provincial Park of Quebec, Laurentides, Quebec, Canada. a foggy haze forming during an autumn evening. Pictures from photo gallery "Sunset Pictures"
This picture is part of the photo album "Sunset Pictures" - there are more beautiful images waiting for you.